The reconciliation in Italy may lift EURUSD up a little but there are other issues in the European Union which delays such growth. The support rests at 1.16680 with resistance at 1.17050 which both lines are above the weekly pivot point at 1.16330. The EMA of 10 is moving with bullish bias in the ascendant channel and it is below the EMA of 200 and the EMA of 100. The RSI is moving on the 50 level, the Stochastic is moving in low ranges and the MACD line is above the signal line in the positive territory. The ADX is not showing any clear signals. 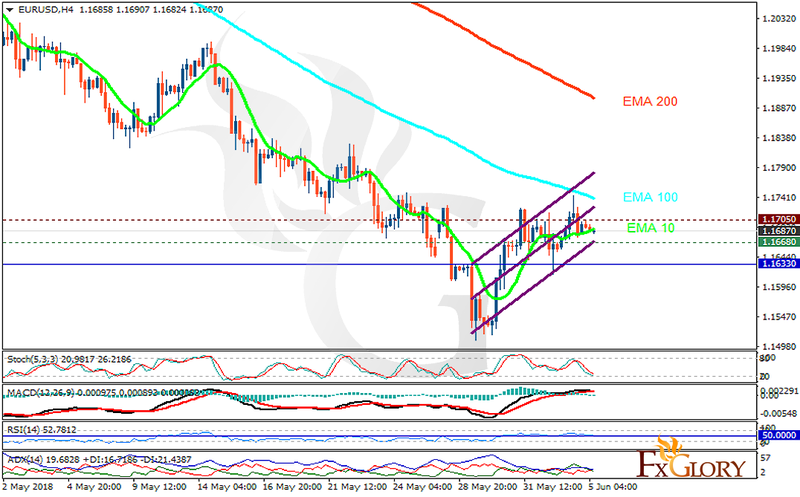 The resistance zone seems to be strong, therefore, EURUSD will decline again towards 1.156.